We know from Isaiah that the Earth will wobble and from Revelation 12 it looks like it could tilt. 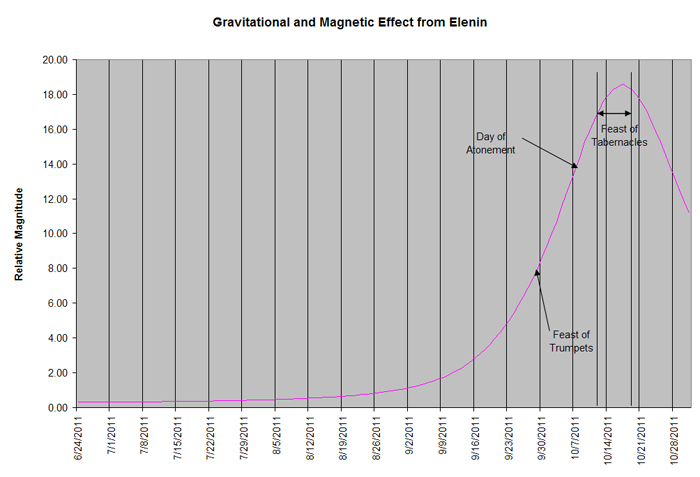 I suspect that Elenin/X will have a much greater effect as it gets closer to Earth. Gravity and magnetism are an inverse function of the square of the distance between the objects. This means that if the distance between Elenin/X and Earth is cut in half, the effect of the forces will go up four times and at 1/4 the distance the force goes up 16 times. On January 11, Elenin/X was 3.443 AU and it will be 0.232 AU at its closest. When you calculate the inverse squares, the difference in both magnetic and gravitational force is 220 times greater this fall than on January 11, 2011, when Greenland experienced the early sunrise. I don't mean to get too bogged down in the math, but what I'm trying to say is that the effects will get much greater this fall, like labor pains.